With the announcement of World of Warcraft: Legion, the upcoming expansion to the popular MMORPG, several new features have been announced. One of the most important new features is the artifact weapons. In World of Warcraft: Legion there will be no more weapons, which you can capture with bosses. Instead, your hero is just at the beginning of the upcoming WoW Addons find an artifact on the islands and creates a powerful weapon for this. This weapon will accompany your hero over the entire extension, and as a result continued to improve, so that each hero their very own copy of the strongest weapons in the Warcraft universe can call his own. Why do we get players this time the strongest and most iconic weapons in the Warcraft universe? Developers attribute this to the threat caused by the Burning Legion and that it can be repulsed only by the most powerful weapons. It is not yet clear how this will lore-technically implemented, but we are already received early in the Addon of 36 artifacts will be for each specialization. From these artifacts to 36 different weapons will be developed. Among these are the most powerful weapons that Azeroth has ever known: the forged from Magni Bronzebeard Ashbringer, Thrall Doomhammer, Sheilun, the rod of the last emperor Pandaria and many more. The new artifact weapons are available for players at level 100 and thus play the entire extension over. Over time, will always continue to strengthen your weapon. Here lies an interesting principle behind that is somewhat reminiscent of the legendary cape in Pandaria, or even the legendary ring in Warlords of Draenor. Each specialization will receive their own quest line, which reflects the history of the weapon. So Retribution Paladins will have to go back to the broken coast and to the fallen heroes, in order to find the Ashbringer. Protection warriors contrast to experience the legendary story of a king and the Frost Vrykul Death Knight must get splinters of Frostmourne from the vaults of the Icecrown Citadel. The specific stories intended to cause the individual classes feel again unique and one identifies with his class again more and different from other classes. The own hero to get last but not least, through both its artifact weapon, the feeling of being something special. This is also apparent when one looks at the different classes and their specializations. Each specialization will receive their very own weapon. In addition, the appearance of each weapon will differ depending on the style of play and progress. Do you play any class, it is worthwhile to also experience each specialization and the various quests. Developing artifact weapons for different specializations of a class is relatively easy to operate while it Twinks. 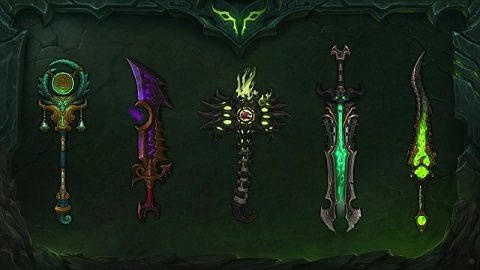 Whether your artifact weapon will be legendary or epic from the outset, is not yet certain. It is also the realm of possibility that the artifact weapons receive a new level of quality, so that they are neither epic nor legendary. The idea that you are working on a legendary object, the developers found probably relatively well - but they want to avoid long waiting times through quests, as the weapons to help you directly in the fight against the Legion. Artifact weapons power when their levels rising. Furthermore, the weapons will be stronger by killing bosses in Legion. By completing various quests you can unlock special features of the weapon. Here, the choice is to be with you who can the properties unlock her first. The player should be able to choose a personal way to play its role and be forced to do anything. On the gamescom 2015 a new interface has already been presented, showing how unlocking the features works. Some properties will be stronger than others, and the developers are at this point not yet sure if all properties can be unlocked or a limited choice will be available. Furthermore, the artifact weapons Relic places will possess that can be unlocked as the game progresses. Relic courses serve to increase the attributes of artifact weapons (such as starch, Spell Power, damage per second). By relics also special bonuses can be unlocked, which enhance the weapon additionally. Relics can be captured in the conventional way with Raid / Dungeon bosses or obtain through quests. Via a special interface, both the design of your weapon, and the colors (with different inks) are subject to change. Beyond a certain degree of power, and to enable the master optics are unlocked weapon. The master-optics will lead to a wide variety of worn weapons forms that can be unlocked through our game experience. This should be coupled, among others, a development stage, for example, the master level of a weapon. Furthermore, we are also through our RAID and PVP progress and various achievements to unlock new skins. In addition, the druids will receive a new form depending on the chosen specialization, the quasi skin on the weapon is based, you don’t see in cat or bear form. To adjust the artifact weapons, it is necessary to seek the class-specific halls. The appearance of artifact weapons is also quite simple to change by transmogrification, bearing in mind that the appearance of artifact weapons can not be transferred to other weapons. The idea behind the whole system is that although all the heroes wear a specialization same weapon, but by presenting their preferences in the game, different optics. The following weapons have already been announced as an artifact weapons, with the way we will get this, is still unclear. In total there will be 36 artifact weapons, which still leaves plenty of room for speculation, what weapons are still finding their way into the game. We will update the list of weapons with each additional notice of course.